THE Ukranian President has sensationally claimed Russian military tanks are lining up along his country’s border, triggering another World War 3 alert. Petro Poroshenko has shown Sky News images of what are apparently tanks gathering along the border, close to where Russia keeps its ammunition. He told the broadcaster: “This is the tank base just 18km (11 miles) from our border, this was happening in September, October, and now. This is 18km from my border, this is the same warehouse where they have their ammunition, the same where they have multi-rocket launch system, we should be prepared to protect my country. The Ukrainian President also appealed for help from Western leaders as tensions between the two countries threaten to boil over. Mr Poroshenko said: “There is no red line for Vladimir Putin and this is the very strong reason why we should be together, the whole civilised world. 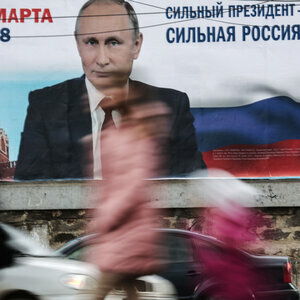 This is the latest worrying developent in rising tensions between the two Soviet neighbours. Last weekend, Russia seized three Ukrainian navy ships and their crew in the Kerch Strait, accusing them of moving into their territory. Russia has been blocking access to the strait and has so far not released the Ukrainian sailors. Ukraine has rejected accusations of tresspassing in the Russian waters. It added two of its ports are effectively under blockade by their Soviet neighbour in the Azov Sea, something that Moscow has denied. Mr Poroshenko also accused Russia of “strangling” Ukraine with continuous restrictions. He said: “They want to hit Ukraine because through Azov Sea, and our sea ports, we export about 40% of our industrial production. World War 3: Is latest Russia-Ukraine clash because Obama was ‘SOFT’? Yesterday, Ukrainian troops started digging trenches after martial law was declared in the country for 30 days. One Ukrainian soldier, Timokha, explained that due to the declaration of martial law, they were seeing a significant increase in military operations. The soldier explained that they were packing emergency rations and ammunition into the trenches “so if something comes up, we can counter an attack by the enemy and move in various directions, not be tied to one place”. Another soldier, Trotsky, added the soldiers were feeling more threatened from the Sea of Azov following the seizure of the three Ukrainian vessels. According to Sergiy, a Ukrainian soldier stationed at Mariupol’s port, little has changed for the troops in the area because they have been ready for conflict since Crimea was annexed by Russia. Additional reporting by Paul Withers. On Thursday, Trump announced he was canceling the meeting he had scheduled with Putin because of Russia’s refusal to release Ukrainian sailors who were detained last Sunday during a standoff between Ukrainian and Russian troops in the Kerch Strait, which separates the Black Sea from the Sea of Azov. The confrontation led caused Ukrainian President Petro Poroshenko to declare martial law in 10 of Ukraine’s regions that are in proximity to Russian military capabilities. But Russian officials said that the situation in Ukraine wasn’t the real reason that Trump opted to cancel the much-anticipated meeting with Putin. On Friday, Kremlin spokesman Dmitry Peskov, known to be Putin’s right-hand man, suggested that the two leaders would engage in a “brief and impromptu” meeting at the G20, even if an official meeting is not scheduled, according to reports. Trump’s cancellation came just hours after Michael Cohen, the president’s former longtime lawyer and fixer, pleaded guilty to lying to Congress about his attempts to launch a Trump Tower project in Moscow at the same time Trump was running for president. Cohen had originally testified that he had dropped the proposal in January 2016, but recently admitted that negotiations had continued until June 2016. Cohen began cooperating with special counsel Robert Mueller, who is investigating potential collusion between the Trump campaign and Russia to influence the outcome of the 2016 presidential election, since he pleaded guilty in August to eight felonies. He is considered a key witness in the Mueller case and, having worked with Trump for more than a decade, could reveal many details about the inner workings of Trump’s business empire and its ties to Russia. Nevertheless, the Mueller investigation appears to be gaining speed since Trump submitted written answers to the investigators’ questions through his lawyers. Mueller is believed to be focusing his attention on the Trump Tower deal and connections between Trump associates and the radical transparency organization Wikileaks. It’s possible, however, that the Russia investigation and the ongoing conflict between Russia and Ukraine, which is now almost in its fifth year, will derail the relationship between Trump and Putin entirely. Multiple claims are covered, see below. There are questions about several of Putin’s claims. TRUE: This may be true, but if so, it was a Russian provocation, not a Ukrainian one. 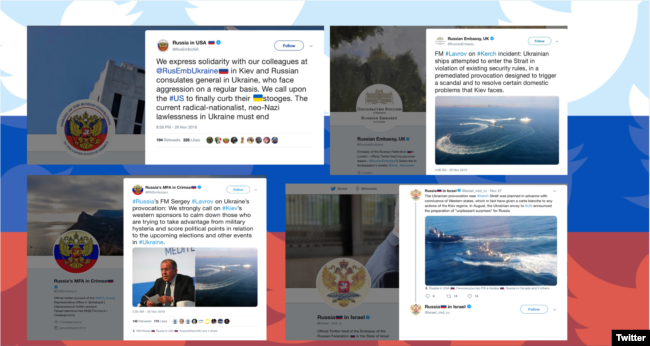 The Russian ships engaged the Ukrainian boats aggressively, even as the Ukrainian naval boats acted in accordance with a bilateral treaty signed by Putin in 2003.The treaty grants free passage through the Kerch strait to commercial and naval vessels of Ukraine and Russia. The Ukrainian Navy claims their vessel gave notification of its intent to transit the strait. Ukraine says a Russian coast guard vessel has rammed one of its navy tugboats off the Moscow-annexed Crimean Peninsula in “openly aggressive actions,” resulting in damage to the ship. FALSE: Putin is implying that the incident was organized by Ukrainian President Poroshenko in order to justify calling off elections scheduled for next year via his decree of martial law. However, the period of martial law will expire on December 26, months before the election, and will only include areas of the country embroiled in conflict. UNCLEAR: This is unclear, because it is unverifiable. Although it is true that Putin’s own approval rating has been boosted by military adventures abroad. FALSE: The Crimea didn’t “decide to join Russia.” The Russian military took the peninsula in unmarked uniforms and the part of the region “voted” under Russian occupation. FALSE: There is no civil war in those regions, but rather a Russian invasion and occupation. FALSE: Use of the strait is governed by the bilateral treaty between the two countries renewed in 2003.By agreement, the the strait and the sea of Azov are considered internal waters of both Ukraine and Russia, and provides for free passage for vessels of both nations.A maritime expert, and radio intercepts, placed the vessels at the 12 nautical mile point in the Black Sea, where Crimean territorial waters end. MISLEADING: Anti-Russian sentiments in Ukraine follow the Russian invasion and occupation of its territory – Crimea in early 2014 and the ongoing Eastern Ukraine conflict, fomented by Russian actors. FALSE: Ukraine’s leadership is routinely criticized by Western governments and human rights watchdogs on a number of topics from corruption and slow reforms, to failure to uphold human rights and press freedom. 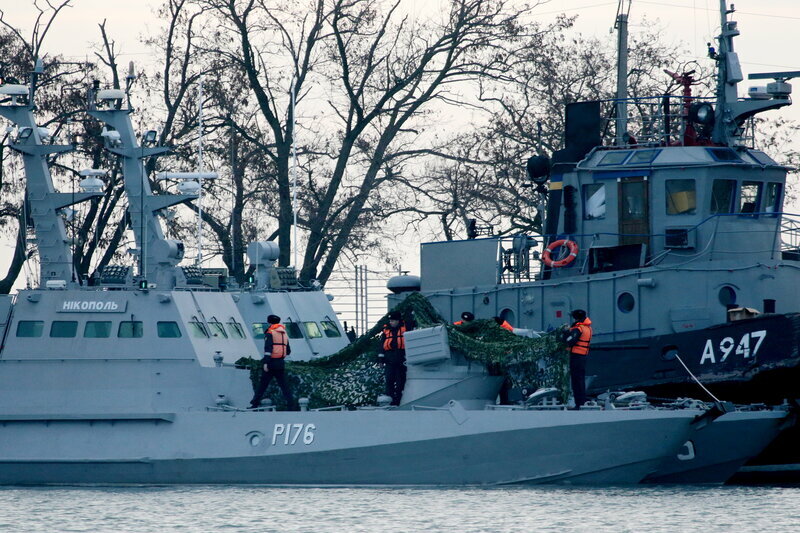 The Nikopol gunboat (left) and the Yany Kapu tugboat of the Ukrainian navy are tugged to the Kerch Seaport. Russian warships seized three Ukrainian naval vessels on Sunday in a narrow waterway that provides access from the Black Sea to the much smaller Sea of Azov near Crimea, ramping up already bitter tensions between the two countries. On Sunday, Russia dispatched warplanes to patrol the area after the Ukrainian navy tried to send the ships through the Kerch Strait, a waterway with strategic significance for both countries that passes under a newly built Russian bridge. In May, President Vladimir Putin personally opened the bridge over the Kerch Strait, connecting the Crimea peninsula — which Moscow seized in 2014 — to Russia’s mainland. 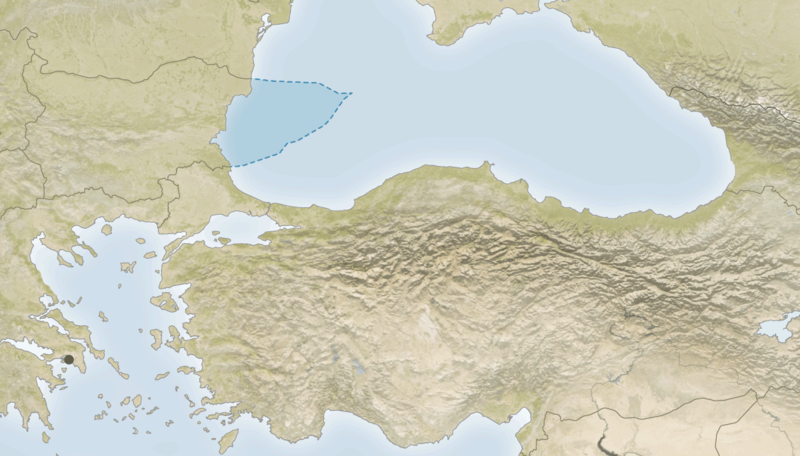 The 12-mile-long span has been touted by Russia as a claim to Crimea. Ukraine, along with nearly every other country in the world, refuses to recognize that claim. Russian vessels rammed one of the Ukrainian boats and opened fire on the other two before seizing all three, along with their crews. Ukrainian officials have said six of its sailors were injured; Russia has said three. The boats were towed to a nearby port. Video from a Russian ship, including strong language from the bridge crew, shows it ramming a Ukrainian tug boat — one of the three vessels that was reportedly seized. In response, Ukrainian President Petro Poroshenko called a late-night meeting with top security officials in the capital city of Kiev. Poroshenko described the incident as open Russian aggression and said he planned to ask parliament to approve the imposition of martial law. Doing so would restrict Ukrainians’ civil liberties and increase state power and give the unpopular president a free hand to postpone elections in March, where he faces an uphill battle to hold onto power. Russian state media said Poroshenko provoked the maritime incident as a means of delaying the election — and potentially to raise the stakes between President Trump and Putin, who are due to meet later this week. Trump has not commented on the incident. Russia accused Ukraine of illegally entering its waters. A spokesman for the FSB, the country’s Federal Security Service — which oversees the coast guard — said the Ukrainian vessels violated territorial waters and had to be stopped. “This is a very dangerous provocation, which requires particular attention and a special investigation,” Russian presidential spokesman Dmitry Peskov told state media. The FSB will release evidence proving “Kiev’s plans to carry out a provocation in the Black Sea,” state media said. Ukraine says its vessels were in operating in accordance with international maritime rules. The incident sparked an international response and concern mainly for Ukraine over its more powerful nemesis. The United Nations Security Council is expected to hold an emergency meeting on the incident Monday. Russia blocked off the strait before the incident and reopened it to commercial shipping early Monday. Relations between the countries have gone steadily downhill since Russia’s 2014 annexation of the Crimea peninsula. Ukraine continues to wage a low-level war against a pro-Moscow separatist insurgency in the eastern part of the country. The Kerch Strait and Sea of Azov are shared territorial waters, according to a 2003 treaty. Russia has focused on exerting more control over the waterway since the annexation — with the Kerch bridge being a key move. 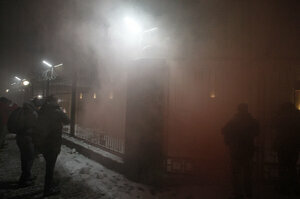 The Russian embassy is seen covered in smoke during a protest of activists, following an incident in the Black Sea near the Crimea annexed by Russia, in which three Ukrainian naval vessels were seized by a Russian border guard vessels. Ukranians reacted to the maritime standoff with anger. About 150 reportedly gathered outside the Russian embassy in Kiev, where a car with Russian diplomatic plates was set on fire. Far-right protesters reportedly burned tires outside the Russian consulate inthe western Ukrainian city of Lviv, saying Poroshenko is not aggressive enough in his relationship with Russia. NPR’s Lucian Kim contributed to this report. Introduction Formerly part of Romania, Moldova was incorporated into the Soviet Union at the close of World War II. Although independent from the USSR since 1991, Russian forces have remained on Moldovan territory east of the Dniester River supporting the Slavic majority population, mostly Ukrainians and Russians, who have proclaimed a “Transnistria” republic. One of the poorest nations in Europe, Moldova became the first former Soviet state to elect a Communist as its president in 2001. History Moldova’s territory was inhabited in ancient times by Dacians. Due to its strategic location on a route between Asia and Europe, Moldova faced several invasions, including those by the Huns, Kievan Rus’ and the Mongols. During the Middle Ages, the territory of Republic of Moldova, that of the Chernivtsi oblast and Budjak of Ukraine, as well as that of the eastern 8 of the 41 counties of Romania comprised the Principality of Moldavia (which, like the present-day republic, was known in Romanian as Moldova). The principality became a tributary to the Ottoman Empire during the 16th century. In 1775 the northwestern part of Moldavia was annexed by the Habsburg Empire, and called Bukovina. In 1812, according to the Treaty of Bucharest between the Ottoman and the Russian Empires, the latter annexed the eastern half of the territory of the Principality of Moldavia, including Khotyn and old Bessarabia (modern Budjak). At first, the Russians used the name “Oblast’ of Moldavia and Bessarabia”, allowing a large degree of autonomy, but later (in 1828) suspended the self-administration and called it Guberniya of Bessarabia, or simply Bessarabia. The western part of Moldavia remained an autonomous principality, and in 1859, united with Wallachia to form the Kingdom of Romania. In 1856, the Treaty of Paris saw two out of nine counties of Bessarabia, Cahul and Ismail, returned to Moldavia, but in 1878, the Treaty of Berlin saw the Kingdom of Romania returning them to the Russian Empire. Upon annexation, after the expulsion of the large Tatar population of Budjak, the Moldovan/Romanian population of Bessarabia was predominant. The colonization of the region in the 19th century lead to an increase in the Russian, Ukrainian, Lipovan, and Cossack populations in the region; this together with a large influx of Bulgarian immigrants, saw an increase of the Slavic population to more than a fifth of the total population by 1920. With the settling of other nationals such as Gagauz, Jews, and Germans, the proportion of the Moldovan population decreased from around 80% to 52% by some sources or to 70% by others during the course of the century. The Tsarist policy in Bessarabia was in part aimed at denationalization of the Romanian element by forbidding after the 1860s education and mass in Romanian. However, the effect was an extremely low literacy rate (in 1897 approx. 18% for males, approx. 4% for females) rather than a denationalization. World War I brought in a rise in political and cultural (national) awareness of the locals, as 300,000 Bessarabians were drafted into the Russian Army formed in 1917, within bigger units several “Moldavian Soldiers’ Committees” were formed. Following the Russian Revolution of 1917, a Bessarabian parliament, Sfatul Ţării (October-November 1917), which was opened on December 3 [O.S. November 21] 1917, proclaimed the Moldavian Democratic Republic (December 15 [O.S. December 2] 1917) within a federal Russian state, and formed its government (December 21 [O.S. December 8] 1917). Bessarabia proclaimed independence from Russia (February 6 [O.S. January 24] 1918), and, under pressure from the Romanian army that entered the region in early January, on April 9 [O.S. March 27] 1918, Sfatul Ţării decided with 86 votes for, 3 against and 36 abstaining, on union with the Kingdom of Romania, conditional upon the fulfillment of the agrarian reform, local autonomy, and respect for universal human rights. The conditions were dropped after Bukovina and Transylvania also joined the Kingdom of Romania. The union was recognized in the Treaty of Paris (1920), which, however, has never came into force since it was not ratified by Japan. The newly-communist Russia did not recognize the Romanian rule over Bessarabia. A mutual treaty between the Soviets and Romania was not signed due to the former’s claims over Bessarabia. In the Kellogg-Briand Treaty of 1928 and the Treaty of London of July 1933, the Soviet Union and Romania have subscribed to the principle of non-violent resolution of territorial disputes. Transnistria, at the time part of the Ukrainian SSR, itself part of the USSR, was formed into the Moldavian ASSR (1924-1940) after the failure of the Tatarbunary Uprising. The agrarian (land) reform, settled by Sfatul Ţării in 1918-1919, resulted in a rise of a middle class, as the rural population of the region represented 80%. Together with peace and favorable economic circumstances, it produced a small economic boom. However, urban development and the industry were insignifiant, the region remaining an agrarian rural region throughout the interwar period. The literacy rate grew from 10.5% to 37% by 1930; however the region still remained lagging in the aspect of education, compared to a 60% literacy rate country average. In an attempt to separate the Bessarabian ethnic minorities from the Russian influence, the Romanian authorities allowed education in any language desired; with time, while Romanian replaced Russian in cities, the authorities sought to reduce the number of people in minority-language education and educate them in Romanian instead. As a result of Ribbentrop-Molotov pact (Article 4 of the secret Annex to the Treaty), Bessarabia was annexed by the USSR, as part of the sphere of influence agreed with Nazi Germany. On June 26, 1940, Romania received an ultimatum from the Soviet Union, demanding the evacuation of the Romanian military and administration from Bessarabia and from the northern part of Bukovina, with an implied threat of invasion in the event of noncompliance. Under pressure from Moscow and Berlin, the Romanian administration and the army were forced to retreat from Bessarabia as well from Northern Bukovina to avoid war. On June 28, 1940, these territories were occupied by the Soviet Union. During the retreat, the Romanian Army was attacked by the Soviet Army, which entered Bessarabia before the Romanian administration finished retreating. Some 42,876 Romanian soldiers and officers were unaccounted for after the retreat. The northern and southern parts, which had sizable non-Moldovan communities (of Ukrainians, Bessarabian Bulgars, Bessarabian Germans and Lipovans), were transferred to the Ukrainian SSR as the Chernivtsi and Izmail Oblasts. At the same time, the Moldavian ASSR, where Moldovans were a plurality, was disbanded, and up to 1/2 of its territory was joined with the remaining territory of Bessarabia to form the Moldavian Soviet Socialist Republic, contiguous with present-day Moldova. Under early Soviet rule, deportations of locals to the northern Urals, Siberia, and Kazakhstan occurred regularly throughout the Stalinist period, with the largest ones on 12-13 June 1941, and 5-6 July 1949, accounting for 19,000 and 35,000 deportees respectively. According to Russian historians, in 1940-1941, ca. 90,000 inhabitants of the annexed territories were subject to political persecutions. In 1946, a severe drought, exaggerated delivery quota obligations the Soviet state imposed on farmers, the forced agricultural requisitions employed by the Soviets because most farmers could not meet these, and the absence of a large part of the male work force (most of the Bessarabians enrolled in 1944 into the Soviet Army were not discharged until late 1946) resulted in a famine (1946-1947), which resulted in 216,000 deaths and about 350,000 cases of dystrophy in MSSR alone. Similar events occurred in 1930s in Transnistria. In 1944-53, there were many anti-Communist armed resistance groups active in Moldova; however the NKVD/MGB managed to uproot most of them with arrests and deportation. After World War II, ethnic Russians and Ukrainians (commonly known as Russophones) immigrated into the new Soviet republic, especially into urbanized areas. The Soviet government began a campaign to promote a Moldovan ethnic identity, different from that of the Romanians, based on a theory developed during the existence of the Moldovan ASSR. Official Soviet policy asserted that the language spoken by Moldovans was distinct from the Romanian language (see History of the Moldovan language). The Moldovan was written in the Cyrillic alphabet, in contrast with Romanian, which was written in the Latin alphabet (the language had used a different variant of the Cyrillic alphabet before 1860); to distinguish the two, when there is a chance of confusion, Moldovans commonly refer to the former as “the Russian alphabet”. Moldovan Cyrillic incorporated slight changes to the Cyrillic alphabet, most notably the use of the letter zhe with a breve (Ӂ – ӂ) to indicate the sound /dʒ/. In 1970s and 1980s, the Moldavian SSR received substantial allocations from the budget of the USSR to develop industrial and scientific facilities as well as housing. In 1971, the Council of Ministers of the USSR adopted a decision “About the measures for further development of the city of Kishinev”, that alloted more than one billion Soviet rubles from the USSR budget; subsequent decisions also directed substantial funding and brought qualified specialists from other parts of the USSR to develop Moldova’s industry. This influx of investments was stopped in 1991 with the dissolution of the Soviet Union, when Moldova became independent. Along with the other peripheral Soviet republics, Moldova started to move towards independence from 1988 onwards; on August 31, 1989 a language law was passed, adopting the Latin alphabet for Moldovan and declaring it the state language of the MSSR. The first free elections for the local parliament were held in February and March 1990. After the attempted Moscow Putsch, Moldova declared its independence on August 27, 1991, and in December of that year signed to be a member of the post-Soviet Commonwealth of Independent States (CIS) along with most of the former Soviet republics. Declaring itself a neutral state, it did not join the military branch of the CIS. At the end of that year, a former communist reformer, Mircea Snegur, won an unchallenged election for the presidency. Three months later, the country achieved formal recognition as an independent state at the United Nations. The part of Moldova east of the Dniester river, Transnistria, which included a larger proportion of ethnic Russians and Ukrainians, claimed independence in 1990, fearing the rise of nationalism in Moldova and the country’s expected reunification with Romania upon secession from the USSR. This caused a brief military conflict between Moldova and forces supporting the secession of Transnistria in 1992. Russian military stationed in the region (14th Army) intervened on the Transnistrian side; it also remained on Moldovan territory east of the Dniester after the end of the military conflict, despite signing international obligations to withdraw, and against the will of Moldovan government. They still remain stationed in Transnistria. Negotiations between the Transnistrian and Moldovan leaders have been going on under the mediation of the OSCE, Russia, and Ukraine; lately observers from the European Union and the USA have become involved. The March 1994 referendum for a new constitution that stated the independence of the republic saw an overwhelming majority of voters in support. Since 2001, the country is a member of the WTO. Politics During the first 10 years of independence, Moldova was governed by coalitions of different parties, led mostly by former communist officials. The 1998 economic crisis in Russia, Moldova’s main economic partner at the time, produced a political and economic crisis in the country. The political flux was cleared in 2001 when elections saw the Party of Communists of Moldova win the majority of seats in the Parliament. Its leader Vladimir Voronin was appointed president. In economic terms, the crisis provoked an emigration of labor, as well as permanent emigration from Moldova. According to the census data, from 1989 to 2004, Moldova has lost about 400,000 inhabitants, or 9% of the population. Analysts estimate that actual emigration could be higher, as many seasonal workers remain registered as living in the country. Over 100,000 people from other former Soviet states have migrated to Moldova in the 10 years after its independence. Ethnically, the dominant group (Moldavians/Romanians) has somewhat strengthened its position, representing 79% outside Transnistria, or 71.5% including Transnistria. In absolute numbers, the Moldovan-Romanian population declined by about 50,000 people compared to 1989, while for Ukrainians and Russians this figure has reached 200,000 of each nationality; most of this change is believed to have occurred between 1998 and 2004. Relationships between Moldova and Russia deteriorated in November 2003 over a Russian proposal for the solution of the Transnistrian conflict, which Moldovan authorities refused to accept. In the following election, held in 2005, the Communist party made a formal 180 degree turn and was re-elected on a pro-Western platform, with Voronin being re-elected to a second term as a president. Since 1999, Moldova has constantly affirmed its desire to join the European Union, and implement its first three-year Action Plan within the framework of the European Neighbourhood Policy (ENP) of the EU. The Netherlands and Australia have taken responsibility for the downing of the Malaysian plane over Ukraine during its flight MH17 in 2014, officials said on Friday, in a move that could trigger a judicial move. In a statement, the Dutch government said the two countries “hold Russia partly responsible for the downing” of the Malaysian plane, a day after investigators found that a Bock missile hit the plane while it was flying, moving from a Russian military unit in Kursk. All 298 passengers, mostly Dutch, were killed. Introduction Ukraine was the center of the first eastern Slavic state, Kyivan Rus, which during the 10th and 11th centuries was the largest and most powerful state in Europe. Weakened by internecine quarrels and Mongol invasions, Kyivan Rus was incorporated into the Grand Duchy of Lithuania and eventually into the Polish-Lithuanian Commonwealth. The cultural and religious legacy of Kyivan Rus laid the foundation for Ukrainian nationalism through subsequent centuries. A new Ukrainian state, the Cossack Hetmanate, was established during the mid-17th century after an uprising against the Poles. Despite continuous Muscovite pressure, the Hetmanate managed to remain autonomous for well over 100 years. During the latter part of the 18th century, most Ukrainian ethnographic territory was absorbed by the Russian Empire. Following the collapse of czarist Russia in 1917, Ukraine was able to bring about a short-lived period of independence (1917-20), but was reconquered and forced to endure a brutal Soviet rule that engineered two artificial famines (1921-22 and 1932-33) in which over 8 million died. In World War II, German and Soviet armies were responsible for some 7 to 8 million more deaths. Although final independence for Ukraine was achieved in 1991 with the dissolution of the USSR, democracy remained elusive as the legacy of state control and endemic corruption stalled efforts at economic reform, privatization, and civil liberties. A peaceful mass protest “Orange Revolution” in the closing months of 2004 forced the authorities to overturn a rigged presidential election and to allow a new internationally monitored vote that swept into power a reformist slate under Viktor YUSHCHENKO. Subsequent internal squabbles in the YUSHCHENKO camp allowed his rival Viktor YANUKOVYCH to stage a comeback in parliamentary elections and become prime minister in August of 2006. An early legislative election, brought on by a political crisis in the spring of 2007, saw Yuliya TYMOSHENKO, as head of an “Orange” coalition, installed as a new prime minister in December 2007. Human settlement in the territory of Ukraine dates back to at least 4500 BC, when the Neolithic Cucuteni culture flourished in a wide area that covered parts of modern Ukraine including Trypillia and the entire Dnieper-Dniester region. During the Iron Age, the land was inhabited by Cimmerians, Scythians, and Sarmatians. Between 700 BC and 200 BC it was part of the Scythian Kingdom, or Scythia. Later, colonies of Ancient Greece, Ancient Rome, and the Byzantine Empire, such as Tyras, Olbia, and Hermonassa, were founded, beginning in the 6th century BC, on the northeastern shore of the Black Sea, and thrived well into the 6th century AD. In the 7th century AD, the territory of eastern Ukraine was the center of Old Great Bulgaria. At the end of the century, the majority of Bulgar tribes migrated in different directions and the land fell into the Khazars’ hands. Map of the Kievan Rus’ in the 11th century. During the Golden Age of Kiev, the lands of Rus’ covered much of present day Ukraine, Belarus, and western Russia. In the 9th century, much of modern-day Ukraine was populated by the Rus’ people who formed the Kievan Rus’. Kievan Rus’ included nearly all territory of modern Ukraine, Belarus, with larger part of it situated on the territory of modern Russia. During the 10th and 11th centuries, it became the largest and most powerful state in Europe. In the following centuries, it laid the foundation for the national identity of Ukrainians and Russians. Kiev, the capital of modern Ukraine, became the most important city of the Rus’. According to the Primary Chronicle, the Rus’ elite initially consisted of Varangians from Scandinavia. The Varangians later became assimilated into the local Slavic population and became part of the Rus’ first dynasty, the Rurik Dynasty. Kievan Rus’ was composed of several principalities ruled by the interrelated Rurikid Princes. The seat of Kiev, the most prestigious and influential of all principalities, became the subject of many rivalries among Rurikids as the most valuable prize in their quest for power. The Golden Age of Kievan Rus’ began with the reign of Vladimir the Great (980–1015), who turned Rus’ toward Byzantine Christianity. During the reign of his son, Yaroslav the Wise (1019–1054), Kievan Rus’ reached the zenith of its cultural development and military power. This was followed by the state’s increasing fragmentation as the relative importance of regional powers rose again. After a final resurgence under the rule of Vladimir Monomakh (1113–1125) and his son Mstislav (1125–1132), Kievan Rus’ finally disintegrated into separate principalities following Mstislav’s death. In the 11th and 12th centuries, constant incursions by nomadic Turkic tribes, such as the Pechenegs and the Kipchaks, caused a massive migration of Slavic populations to the safer, heavily forested regions of the north. The 13th century Mongol invasion devastated Kievan Rus’. Kiev was totally destroyed in 1240. On the Ukrainian territory, the state of Kievan Rus’ was succeeded by the principalities of Galich (Halych) and Volodymyr-Volynskyi, which were merged into the state of Galicia-Volhynia. In the centuries following the Mongol invasion, much of Ukraine was controlled by Lithuania (from the 14th century on) and since the Union of Lublin (1569) by Poland, as seen at this outline of the Polish-Lithuanian Commonwealth as of 1619. “Reply of the Zaporozhian Cossacks to Sultan Mehmed IV of the Ottoman Empire.” Painted by Ilya Repin from 1880 to 1891. In the mid-14th century, Galicia-Volhynia was subjugated by Casimir the Great of Poland, while the heartland of Rus’, including Kiev, fell under the Gediminas of the Grand Duchy of Lithuania after the Battle on the Irpen’ River. Following the 1386 Union of Krevo, a dynastic union between Poland and Lithuania, most of Ukraine’s territory was controlled by the increasingly Ruthenized local Lithuanian nobles as part of the Grand Duchy of Lithuania. At this time, the term Ruthenia and Ruthenians as the Latinized versions of “Rus'”, became widely applied to the land and the people of Ukraine, respectively. By 1569, the Union of Lublin formed the Polish-Lithuanian Commonwealth, and a significant part of Ukrainian territory was moved from largely Ruthenized Lithuanian rule to the Polish administration, as it was transferred to the Polish Crown. Under the cultural and political pressure of Polonisation much of the Ruthenian upper class converted to Catholicism and became indistinguishable from the Polish nobility. Thus, the Ukrainian commoners, deprived of their native protectors among Ruthenian nobility, turned for protection to the Cossacks, who remained fiercely orthodox at all times and tended to turn to violence against those they perceived as enemies, particularly the Polish state and its representatives. Ukraine suffered a series of Tatar invasions, the goal of which was to loot, pillage and capture slaves into jasyr. In the mid-17th century, a Cossack military quasi-state, the Zaporozhian Host, was established by the Dnieper Cossacks and the Ruthenian peasants fleeing Polish serfdom. Poland had little real control of this land (Wild Fields), yet they found the Cossacks to be a useful fighting force against the Turks and Tatars, and at times the two allied in military campaigns. However, the continued enserfment of peasantry by the Polish nobility emphasized by the Commonwealth’s fierce exploitation of the workforce, and most importantly, the suppression of the Orthodox Church pushed the allegiances of Cossacks away from Poland. Their aspiration was to have representation in Polish Sejm, recognition of Orthodox traditions and the gradual expansion of the Cossack Registry. These were all vehemently denied by the Polish nobility. The Cossacks eventually turned for protection to Orthodox Russia, a decision which would later lead towards the downfall of the Polish-Lithuanian state, and the preservation of the Orthodox Church and in Ukraine. In 1648, Bohdan Khmelnytsky led the largest of the Cossack uprisings against the Commonwealth and the Polish king John II Casimir. Left-bank Ukraine was eventually integrated into Russia as the Cossack Hetmanate, following the 1654 Treaty of Pereyaslav and the ensuing Russo-Polish War. After the partitions of Poland at the end of the 18th century by Prussia, Habsburg Austria, and Russia, Western Ukrainian Galicia was taken over by Austria, while the rest of Ukraine was progressively incorporated into the Russian Empire. Despite the promises of Ukrainian autonomy given by the Treaty of Pereyaslav, the Ukrainian elite and the Cossacks never received the freedoms and the autonomy they were expecting from Imperial Russia. However, within the Empire, Ukrainians rose to the highest offices of Russian state, and the Russian Orthodox Church. At a later period, the tsarist regime carried the policy of Russification of Ukrainian lands, suppressing the use of the Ukrainian language in print, and in public. The sparsely inhabited area of the Wild Fields, immediately south of Severia, was traditionally used by the Crimean Tatars and Nogai Tatars to launch annual raids into Russian territories along the Muravsky Trail and Izyum Trail. After a number of Russo-Crimean Wars, the Russian monarchs started to encourage the settlement of the Sloboda Ukraine by the Cossacks who acted as a sort of frontier guards against the raids of the Tatars. After the annexation of the Crimean Khanate by the Imperial Russia (1774-1792) following the Russo-Turkish wars, the region was settled by enserfed peasantry mostly from Ukraine and German settlers as New Russia. The Crimean War in the 1850s caused a major exodus of Tatars. The area that was Little Tartary is currently part of Ukraine. Ukraine entered World War I on the side of both the Central Powers, under Austria, and the Triple Entente, under Russia. 3.5 million Ukrainians fought with the Imperial Russian Army, while 250,000 fought for the Austro-Hungarian Army. During the war, Austro-Hungarian authorities established the Ukrainian Legion to fight against the Russian Empire. This legion was the foundation of the Ukrainian Galician Army that fought against the Bolsheviks and Poles in the post World War I period (1919–23). Those suspected of the Russophile sentiments in Austria were treated harshly. Up to 5,000 supporters of the Russian Empire from Galicia were detained and placed in Austrian internment camps in Talerhof, Styria, and in a fortress at Terezín (now in the Czech Republic). With the collapse of the Russian and Austrian empires following World War I and the Russian Revolution of 1917, a Ukrainian national movement for self-determination reemerged. During 1917–20, several separate Ukrainian states briefly emerged: the Ukrainian People’s Republic, the Hetmanate, the Directorate and the pro-Bolshevik Ukrainian Soviet Socialist Republic (or Soviet Ukraine) successively established territories in the former Russian Empire; while the West Ukrainian People’s Republic emerged briefly in the former Austro-Hungarian territory. In the midst of Civil War, an anarchist movement called the Black Army led by Nestor Makhno also developed in Southern Ukraine. However with Western Ukraine’s defeat in the Polish-Ukrainian War followed by the failure of the further Polish offensive that was repelled by the Bolsheviks. According to the Peace of Riga concluded between the Soviets and Poland, western Ukraine was officially incorporated into Poland who in turn recognised the Ukrainian Soviet Socialist Republic in March 1919, that later became a founding member of the Union of Soviet Socialist Republics or the Soviet Union in December, 1922. The revolution that brought the Soviet government to power devastated Ukraine. It left over 1.5 million people dead and hundreds of thousands homeless. The Soviet Ukraine had to face the famine of 1921. Seeing the exhausted society, the Soviet government remained very flexible during the 1920s. Thus, the Ukrainian culture and language enjoyed a revival, as Ukrainisation became a local implementation of the Soviet-wide Korenisation (literally indigenisation) policy. The Bolsheviks were also committed to introducing universal health care, education and social-security benefits, as well as the right to work and housing. Women’s rights were greatly increased through new laws aimed to wipe away centuries-old inequalities. Most of these policies were sharply reversed by the early-1930s after Joseph Stalin gradually consolidated power to become the de facto communist party leader and a dictator of the Soviet Union. Starting from the late 1920s, Ukraine was involved in the Soviet industrialisation and the republic’s industrial output quadrupled in the 1930s. However, the industrialisation had a heavy cost for the peasantry, demographically a backbone of the Ukrainian nation. To satisfy the state’s need for increased food supplies and to finance industrialisation, Stalin instituted a program of collectivisation of agriculture as the state combined the peasants’ lands and animals into collective farms and enforcing the policies by the regular troops and secret police. Those who resisted were arrested and deported and the increased production quotas were placed on the peasantry. The collectivisation had a devastating effect on agricultural productivity. As the members of the collective farms were not allowed to receive any grain until the unachievable quotas were met, starvation in the Soviet Union became widespread. In 1932–33, millions starved to death in a man-made famine known as Holodomor. Scholars are divided as to whether this famine fits the definition of genocide, but the Ukrainian parliament and more than a dozen other countries recognise it as the genocide of the Ukrainian people. The times of industrialisation and Holodomor also coincided with the Soviet assault on the national political and cultural elite often accused in “nationalist deviations”. Two waves of Stalinist political repression and persecution in the Soviet Union (1929–34 and 1936–38) resulted in the killing of some 681,692 people; this included four-fifths of the Ukrainian cultural elite and three quarters of all the Red Army’s higher-ranking officers. After France surrendered to Germany, Romania ceded Bessarabia and northern Bukovina to Soviet demands. The Ukrainian SSR incorporated northern and southern districts of Bessarabia, the northern Bukovina, and the Soviet-occupied Hertsa region. But it ceded the western part of the Moldavian Autonomous Soviet Socialist Republic to the newly created Moldavian Soviet Socialist Republic. All these territorial gains were internationally recognised by the Paris peace treaties of 1947. German armies invaded the Soviet Union on June 22, 1941, thereby initiating four straight years of incessant total war. The Axis allies initially advanced against desperate but unsuccessful efforts of the Red Army. In the encirclement battle of Kiev, the city was acclaimed as a “Hero City”, for the fierce resistance by the Red Army and by the local population. More than 600,000 Soviet soldiers (or one quarter of the Western Front) were killed or taken captive there. Although the wide majority of Ukrainians fought alongside the Red Army and Soviet resistance, some elements of the Ukrainian nationalist underground created an anti-Soviet nationalist formation in Galicia, the Ukrainian Insurgent Army (1942) that at times engaged the Nazi forces; while another nationalist movement fought alongside the Nazis. In total, the number of ethnic Ukrainians that fought in the ranks of the Soviet Army is estimated from 4.5 million to 7 million. The pro-Soviet partisan guerrilla resistance in Ukraine is estimated to number at 47,800 from the start of occupation to 500,000 at its peak in 1944; with about 50 percent of them being ethnic Ukrainians. Generally, the Ukrainian Insurgent Army’s figures are very undependable, ranging anywhere from 15,000 to as much as 100,000 fighters. Initially, the Germans were even received as liberators by some western Ukrainians, who had only joined the Soviet Union in 1939. However, brutal German rule in the occupied territories eventually turned its supporters against the occupation. Nazi administrators of conquered Soviet territories made little attempt to exploit the population of Ukrainian territories’ dissatisfaction with Stalinist political and economic policies. Instead, the Nazis preserved the collective-farm system, systematically carried out genocidal policies against Jews, deported others to work in Germany, and began a systematic depopulation of Ukraine to prepare it for German colonisation, which included a food blockade on Kiev. The republic was heavily damaged by the war, and it required significant efforts to recover. More than 700 cities and towns and 28,000 villages were destroyed. The situation was worsened by a famine in 1946–47 caused by the drought and the infrastructure breakdown that took away tens of thousands of lives. The nationalist anti-Soviet resistance lasted for years after the war, chiefly in Western Ukraine, but also in other regions. The Ukrainian Insurgent Army, continued to fight the USSR into the 1950s. Using guerilla war tactics, the insurgents targeted for assassination and terror those who they perceived as representing, or cooperating at any level with, the Soviet state. Following the death of Stalin in 1953, Nikita Khrushchev became the new leader of the USSR. Being the First Secretary of the Communist Party of Ukrainian SSR in 1938-49, Khrushchev was intimately familiar with the republic and after taking power union-wide, he began to emphasize the friendship between the Ukrainian and Russian nations. In 1954, the 300th anniversary of the Treaty of Pereyaslav was widely celebrated, and in particular, Crimea was transferred from the Russian SFSR to the Ukrainian SSR. Already by the 1950s, the republic fully surpassed pre-war levels of industry and production. It also became an important center of the Soviet arms industry and high-tech research. Such an important role resulted in a major influence of the local elite. Many members of the Soviet leadership came from Ukraine, most notably Leonid Brezhnev, who would later oust Khrushchev and become the Soviet leader from 1964 to 1982, as well as many prominent Soviet sportspeople, scientists and artists. On April 26, 1986, a reactor in the Chernobyl Nuclear Power Plant exploded, resulting in the Chernobyl disaster, the worst nuclear reactor accident in history. At the time of the accident seven million people lived in the contaminated territories, including 2.2 million in Ukraine. After the accident, a new city, Slavutych, was built outside the exclusion zone to house and support the employees of the plant, which was decommissioned in 2000. Around 150,000 people were evacuated from the contaminated area, and 300,000–600,000 took part in the cleanup. By 2000, about 4,000 Ukrainian children had been diagnosed with thyroid cancer caused by radiation released by this incident. Other Chernobyl disaster effects include other forms of cancer and genetic abnormalities, affecting newborns and children in particular. On July 16, 1990, the new parliament adopted the Declaration of State Sovereignty of Ukraine. The declaration established the principles of the self-determination of the Ukrainian nation, its democracy, political and economic independence, and the priority of Ukrainian law on the Ukrainian territory over Soviet law. A month earlier, a similar declaration was adopted by the parliament of the Russian SFSR. This started a period of confrontation between the central Soviet, and new republican authorities. In August 1991, a conservative faction among the Communist leaders of the Soviet Union attempted a coup to remove Mikhail Gorbachev and to restore the Communist party’s power. After the attempt failed, on August 24, 1991 the Ukrainian parliament adopted the Act of Independence in which the parliament declared Ukraine as an independent democratic state. A referendum and the first presidential elections took place on December 1, 1991. That day, more than 90 percent of the Ukrainian people expressed their support for the Act of Independence, and they elected the chairman of the parliament, Leonid Kravchuk to serve as the first President of the country. At the meeting in Brest, Belarus on December 8, followed by Alma Ata meeting on December 21, the leaders of Belarus, Russia, and Ukraine, formally dissolved the Soviet Union and formed the Commonwealth of Independent States (CIS). Ukraine was initially viewed as a republic with favorable economic conditions in comparison to the other regions of the Soviet Union. However, the country experienced deeper economic slowdown than some of the other former Soviet Republics. During the recession, Ukraine lost 60 percent of its GDP from 1991 to 1999, and suffered five-digit inflation rates. Dissatisfied with the economic conditions, as well as crime and corruption, Ukrainians protested and organised strikes. The Ukrainian economy stabilized by the end of the 1990s. A new currency, the hryvnia, was introduced in 1996. Since 2000, the country has enjoyed steady economic growth averaging about seven percent annually. A new Constitution of Ukraine was adopted in 1996, which turned Ukraine into a semi-presidential republic and established a stable political system. Kuchma was, however, criticized by opponents for concentrating too much of power in his office, corruption, transferring public property into hands of loyal oligarchs, discouraging free speech, and electoral fraud. In 2004, Viktor Yanukovych, then Prime Minister, was declared the winner of the presidential elections, which had been largely rigged, as the Supreme Court of Ukraine later ruled. The results caused a public outcry in support of the opposition candidate, Viktor Yushchenko, who challenged the results and led the peaceful Orange Revolution. The revolution brought Viktor Yushchenko and Yulia Tymoshenko to power, while casting Viktor Yanukovych in opposition. Politics Ukraine is a republic under a mixed semi-parliamentary semi-presidential system with separate legislative, executive, and judicial branches. The President is elected by popular vote for a five-year term and is the formal head of state. Ukraine’s legislative branch includes the 450-seat unicameral parliament, the Verkhovna Rada. The parliament is primarily responsible for the formation of the executive branch and the Cabinet of Ministers, which is headed by the Prime Minister. Laws, acts of the parliament and the cabinet, presidential decrees, and acts of the Crimean parliament may be abrogated by the Constitutional Court, should they be found to violate the Constitution of Ukraine. Other normative acts are subject to judicial review. The Supreme Court is the main body in the system of courts of general jurisdiction. Local self-government is officially guaranteed. Local councils and city mayors are popularly elected and exercise control over local budgets. The heads of regional and district administrations are appointed by the president. The European Union offered an Association Agreement with Ukraine in September, 2008. The country is a potential candidate for future enlargement of the European Union. Diplomatic representation from the US: chief of mission: Ambassador William B. TAYLOR Jr.
Culture Ukrainian customs are heavily influenced by Christianity, which is the dominant religion in the country. Gender roles also tend to be more traditional, and grandparents play a greater role in raising children than in the West. The culture of Ukraine has been also influenced by its eastern and western neighbours, which is reflected in its architecture, music and art. The Communist era had quite a strong effect on the art and writing of Ukraine. In 1932, Stalin made socialist realism state policy in the Soviet Union when he promulgated the decree “On the Reconstruction of Literary and Art Organisations”. This greatly stifled creativity. During the 1980s glasnost (openness) was introduced and Soviet artists and writers again became free to express themselves as they wanted. The tradition of the Easter egg, known as pysanky, has long roots in Ukraine. These eggs were drawn on with wax to create a pattern; then, the dye was applied to give the eggs their pleasant colours, the dye did not affect the previously wax-coated parts of the egg. After the entire egg was dyed, the wax was removed leaving only the colourful pattern. 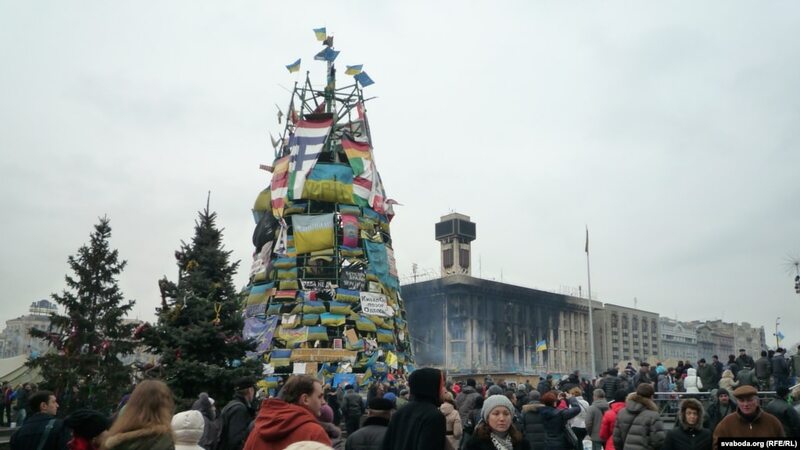 This tradition is thousands of years old, and precedes the arrival of Christianity to Ukraine. In the city of Kolomya near the foothills of the Carpathian mountains in 2000 was built the museum of Pysanka which won a nomination as the monument of modern Ukraine in 2007, part of the Seven Wonders of Ukraine action. 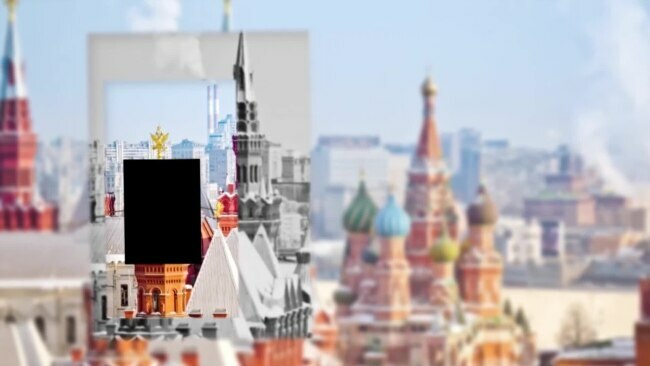 Economy Economy – overview: After Russia, the Ukrainian republic was far and away the most important economic component of the former Soviet Union, producing about four times the output of the next-ranking republic. Its fertile black soil generated more than one-fourth of Soviet agricultural output, and its farms provided substantial quantities of meat, milk, grain, and vegetables to other republics. Likewise, its diversified heavy industry supplied the unique equipment (for example, large diameter pipes) and raw materials to industrial and mining sites (vertical drilling apparatus) in other regions of the former USSR. Shortly after independence was ratified in December 1991, the Ukrainian Government liberalized most prices and erected a legal framework for privatization, but widespread resistance to reform within the government and the legislature soon stalled reform efforts and led to some backtracking. Output by 1999 had fallen to less than 40% of the 1991 level. Ukraine’s dependence on Russia for energy supplies and the lack of significant structural reform have made the Ukrainian economy vulnerable to external shocks. Ukraine depends on imports to meet about three-fourths of its annual oil and natural gas requirements. A dispute with Russia over pricing in late 2005 and early 2006 led to a temporary gas cut-off; Ukraine concluded a deal with Russia in January 2006 that almost doubled the price Ukraine pays for Russian gas. Outside institutions – particularly the IMF – have encouraged Ukraine to quicken the pace and scope of reforms. Ukrainian Government officials eliminated most tax and customs privileges in a March 2005 budget law, bringing more economic activity out of Ukraine’s large shadow economy, but more improvements are needed, including fighting corruption, developing capital markets, and improving the legislative framework. Ukraine’s economy was buoyant despite political turmoil between the prime minister and president until mid-2008. Real GDP growth reached roughly 7% in 2006-07, fueled by high global prices for steel – Ukraine’s top export – and by strong domestic consumption, spurred by rising pensions and wages. The drop in steel prices and Ukraine’s exposure to the global financial crisis due to aggressive foreign borrowing has lowered growth in 2008 and the economy probably will contract in 2009. Ukraine reached an agreement with the IMF for a $16.5 billion standby arrangement in November 2008 to deal with the economic crisis. However, political turmoil in Ukraine as well as deteriorating external conditions are likely to hamper efforts for economic recovery. than a millennium old, shedding light on early empires and trade routes. The medieval ship lay more than a half-mile down at the bottom of the Black Sea, its masts, timbers and planking undisturbed in the darkness for seven or eight centuries. Lack of oxygen in the icy depths had ruled out the usual riot of creatures that feast on sunken wood. This fall, a team of explorers lowered a robot on a long tether, lit up the wreck with bright lights and took thousands of high-resolution photos. A computer then merged the images into a detailed portrait. Archaeologists date the discovery to the 13th or 14th century, opening a new window on forerunners of the 15th- and 16th-century sailing vessels that discovered the New World, including those of Columbus. 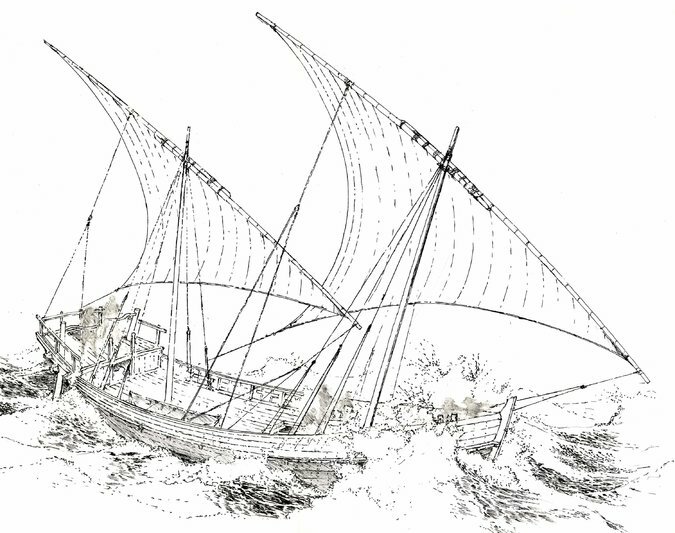 This medieval ship probably served the Venetian empire, which had Black Sea outposts. Never before had this type of ship been found in such complete form. The breakthrough was the quarterdeck, from which the captain would have directed a crew of perhaps 20 sailors. 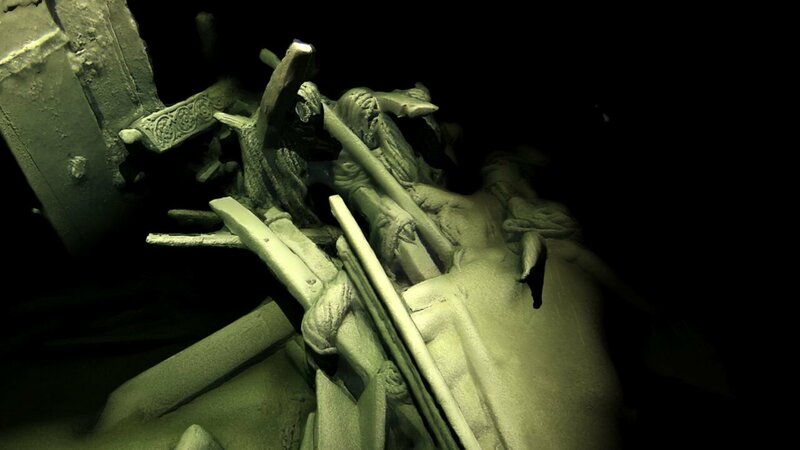 Could Shipwrecks Lead the World to War? Remarkably, the find is but one of more than 40 shipwrecks that the international team recently discovered and photographed off the Bulgarian coast in one of archaeology’s greatest coups. In age, the vessels span a millennium, from the Byzantine to the Ottoman empires, from the ninth to the 19th centuries. Generally, the ships are in such good repair that the images reveal intact coils of rope, rudders and elaborately carved decorations. “They’re astonishingly preserved,” said Jon Adams, the leader of the Black Sea project and founding director of the maritime archaeology center at the University of Southampton. Independent experts said the annals of deepwater archaeology hold few, if any, comparable sweeps of discovery in which shipwrecks have proved to be so plentiful, diverse and well-preserved. Goods traded on the Black Sea included grains, furs, horses, oils, cloth, wine and people. The Tatars turned Christians into slaves who were shipped to places like Cairo. For Europeans, the sea provided access to a northern branch of the Silk Road and imports of silk, satin, musk, perfumes, spices and jewels. Marco Polo reportedly visited the Black Sea, and Italian merchant colonies dotted its shores. The profits were so enormous that, in the 13th and 14th centuries, Venice and Genoa fought a series of wars for control of the trade routes, including those of the Black Sea. 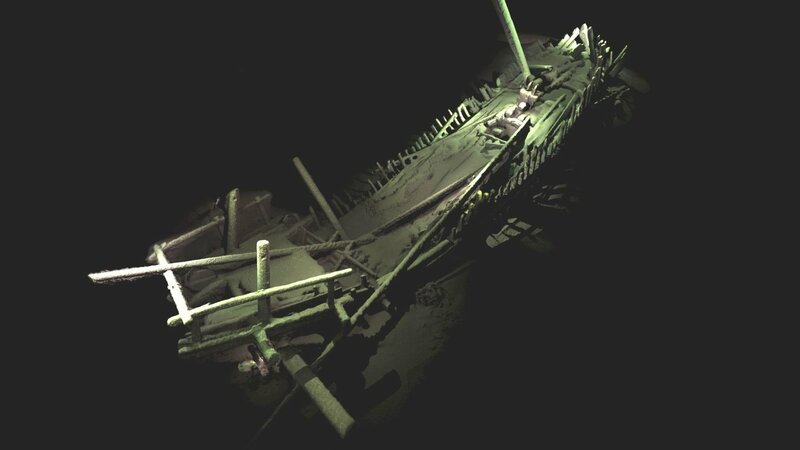 Brendan P. Foley, an archaeologist at the Woods Hole Oceanographic Institution on Cape Cod, Mass., said the good condition of the shipwrecks implied that many objects inside their hulls might also be intact. Experts said the success in Bulgarian waters might inspire other nations that control portions of the Black Sea to join the archaeological hunt. They are Georgia, Romania, Russia, Turkey and Ukraine. For ages, the Black Sea was a busy waterway that served the Balkans, the Eurasian steppes, the Caucasus, Asia Minor, Mesopotamia and Greece. It long beckoned to archaeologists because they knew its deep waters lacked oxygen, a rarity for large bodies of water. The great rivers of Eastern Europe — the Don, the Danube, the Dnieper — pour so much fresh water into the sea that a permanent layer forms over denser, salty water from the Mediterranean. As a result, oxygen from the atmosphere that mixes readily with fresh water never penetrates the inky depths. In 1976, Willard Bascom, a pioneer of oceanography, in his book “Deep Water, Ancient Ships,” called the Black Sea unique among the world’s seas and a top candidate for exploration and discovery. In 2002, Robert D. Ballard, a discoverer of the sunken Titanic, led a Black Sea expedition that found a 2,400-year-old wreck laden with the clay storage jars of antiquity. One held remnants of a large fish that had been dried and cut into steaks, a popular food in ancient Greece. The new team said it received exploratory permits from the Bulgarian ministries of culture and foreign affairs and limited its Black Sea hunts to parts of that nation’s exclusive economic zone, which covers thousands of square miles and runs up to roughly a mile deep. Although the team’s official name is the Black Sea Maritime Archaeology Project, or Black Sea MAP, it also hauls up sediments to hunt for clues to how the sea’s rising waters engulfed former land surfaces and human settlements. Team members listed on its website include the Bulgarian National Institute of Archaeology, the Bulgarian Center for Underwater Archaeology, Sodertorn University in Sweden, and the Hellenic Center for Marine Research in Greece. Nothing is known publicly about the cost, presumably vast, of the Black Sea explorations, which are to run for three years. The endeavor began last year with a large Greek ship doing a preliminary survey. This year, the main vessel was the Stril Explorer, a British-flagged ship bearing a helicopter landing pad that usually services the undersea pipes and structures of the offshore oil industry. 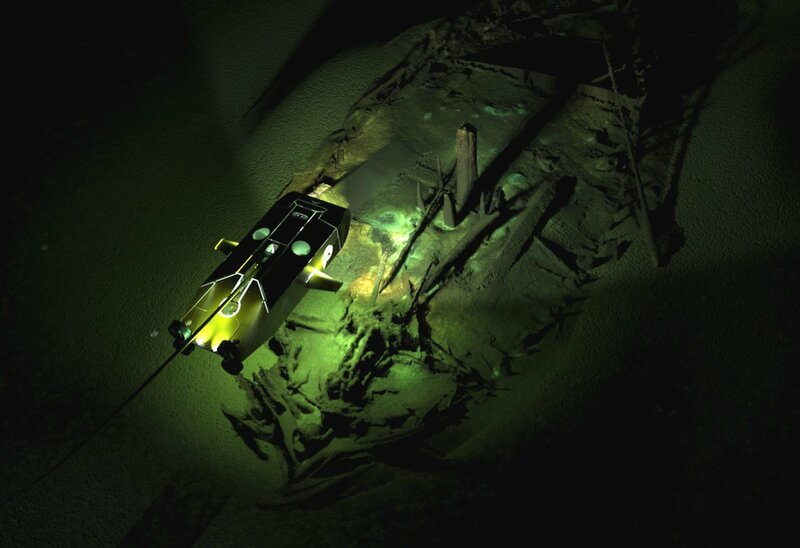 Instead, archaeologists on the ship lowered its sophisticated robots to hunt for ancient shipwrecks and lost history. In an interview, Dr. Pacheco-Ruiz of the University of Southampton said he was watching the monitors late one night in September when the undersea robot lit up a large wreck in a high state of preservation. Dr. Pacheco-Ruiz said the vessel hailed from the Ottoman Empire, whose capital was Constantinople (today Istanbul), and most likely went down sometime between the 17th and 19th centuries. He said the team nicknamed it “Flower of the Black Sea” because its deck bears ornate carvings, including two large posts with tops that form petals. In an interview, Dr. Batchvarov of the University of Connecticut said most of the discoveries date to the Ottoman era. So it was that, late one night, during his shift, he assumed that a new wreck coming into view would be more of the same. “Then I saw a quarter rudder,” he recalled, referring to a kind of large steering oar on a ship’s side. It implied the wreck was much older. Then another appeared. Quickly, he had the expedition’s leader, Dr. Adams, awakened. 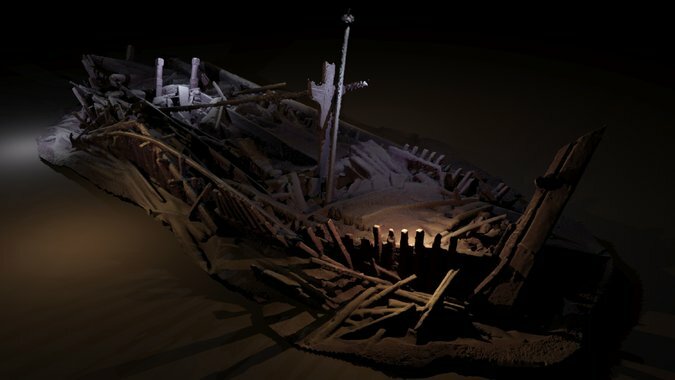 Dr. Batchvarov said the wreck — the medieval one found more than a half-mile down — was part of a class known by several names, including cocha and “round ship.” The latter name arose from how its ample girth let it carry more cargo and passengers than a warship. Dr. Adams said the remarkable color images of the lost ships derived from a process known as photogrammetry. It combines photography with the careful measurement of distances between objects, letting a computer turn flat images into renderings that seem three-dimensional. He said tethered robots shot the photographic images with video and still cameras. The distance information, he added, came from advanced sonars, which emit high-pitched sounds that echo through seawater. Their measurements, he said, can range down to less than a millimeter. Filmmakers are profiling the Black Sea hunt in a documentary, according to the team’s website. The team has said little publicly on whether it plans to excavate the ships — a topic on which nations, academics and treasure hunters have long clashed. Bulgaria is a signatory to the 2001 United Nations convention that outlaws commercial trade in underwater cultural heritage and sets out guidelines on such things as artifact recovery and public display. Dr. Pacheco-Ruiz said the team had so far discovered and photographed 44 shipwrecks, and that more beckoned. Which was the most important? Dr. Adams said that for him, a student of early European shipbuilding, the centerpiece was the medieval round ship. He said it evoked Marco Polo and city states like Venice. The ship, he added, incorporated a number of innovations that let it do more than its predecessors had and paved the way for bigger things to come. I’m not very proud of that title, but I do believe it to be the truth. We here on the news that President Putin has an approval rate of 86% in Russia by their countries people. A lot of our American politicians are on the south side of 20%. If we are to believe the news programs here in the States then the Russian People are being lied to about what President Putin has been doing with Russia’s Sons and Daughters and the Russian People’s money. If what we are being told here in America is the truth this lowers President Putin to the level of George W Bush for being a liar and a War Criminal. O, by the way, we are being told that anti-American sentiment is at an all time high among the Russian People. What would President Putin’s poll numbers be if the Russian People were being told the truth about Crimea, Ukraine, Syria and His 200 billion dollar personal fortune our news programs say he has amassed for himself while he cuts his staff’s salaries and puts the full weight of the International Sanctions upon his people’s backs that he himself has personally caused? But then, we are forced to understand the fact that not everything we here on the news, or the things that come out of politicians mouths is always necessarily the actual real 100% truth! Does your mind ever cross the thought of how someone like Mr Putin was ever able to get into power in Russia in the first place? I believe that Americans (not all of us) are a huge cause of this World Tragedy (Mr Putin coming into power and now gaining power). As you should be well aware of we have a lot of politicians, D.C Talking Heads, Holly Wood Producers, and some Generals who love to put their mouths in front of a microphone. Soon after the Berlin Wall came down in 1989 we started hearing derogatory comments, not so much about the Soviet Union, but a lot about the country of Russia itself. We would see and hear comments in movies and hear from the fore mentioned mouth pieces how backward the Russians were, often portraying them as less capable or as less educated as we Americans are. But, one big thing that is still being said today about Russia is how we are the only World Superpower, removing Russia and China from the former “Big Three”. What we have done my friends is we have on purpose bad mouthed this Great Nation of Human Beings, we have been stomping on other Human Beings pride and shoving that stupidity in their faces. We went from being considered as a friendly nation into their perceived arch enemies once again. 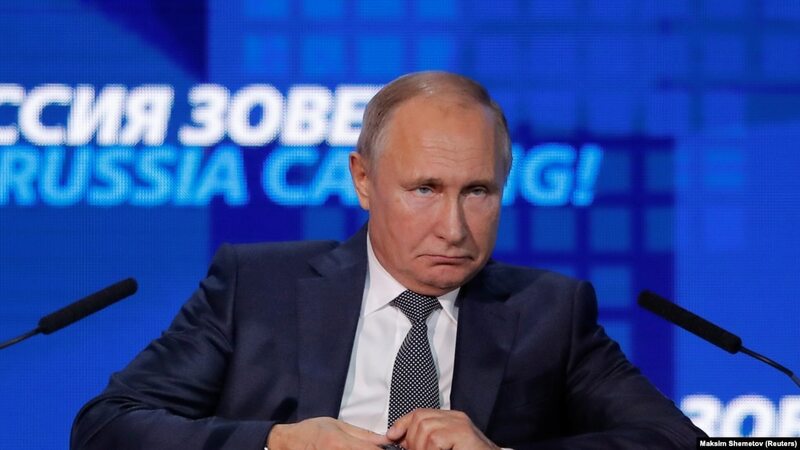 This arrogance, this ignorance, allowed a person like Mr. Putin the opportunity to come to power in Their Nation, with promising the people that he would bring their swagger back. Through his arrogance, his lies, and his evil KGB Mother Russian style brain he has been successful in doing so. There was and is no excuse for how Our Nations mouth pieces have treated the Russian People since the Soviet Union split up. Any nation who has Nuclear Weapons with multiple available delivery systems is a Super Power! If a country has the ability to wipe another country off the face of the earth, they do not need to have their national pride constantly being stomped on. If we as a Nation had/would have been treating the Russian People as respected friends, Mr Putin and Communist minds like his would never have come into power in the first place in Russia. It’s not just the Russian People we have been acting ignorant toward either, if you haven’t noticed there is a Big Red Star rising in the Far East.